The cervical spine (neck) is made up of seven vertebrae (bones) and a system of supporting muscles, ligaments, and tendons. The vertebrae are referred to as C1 to C7 and serve the purpose of protecting the spinal cord while allowing for movement of the head. The cervical spine normally has a backward “c” shape, known as a lordotic curve. The anatomy of the cervical spine differs from the rest of the spine in several ways. The first two vertebrae, C1 and C2, have a different structure and function than the rest of the neck bones. C1, also known as the atlas, pivots on C2 (axis). The purpose of these two vertebrae is to allow for rotation of the head. Also along each vertebrae, there are openings on both sides that contain arteries and veins. 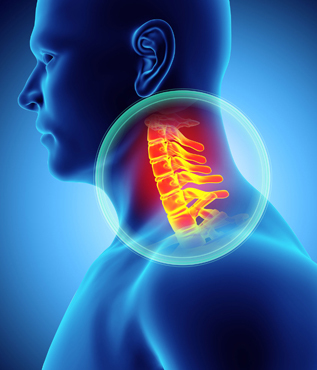 The facet joints, which can also be found on both sides of each vertebrae, allow for motion of the vertebral body and can serve as possible source of neck pain for some. On the backside of each vertebral body is a thin ring of bone that is commonly called the vertebral arch. The spinal cord arises from the brain and travels down this tunnel created by each vertebral arch. There are 8 pair of cervical nerves which branch off of the spinal cord and control various bodily functions to organs and muscles. Extending from each arch is the spinous process. This serves as an attachment point for ligaments which helps limit excessive movement. Muscle support of the cervical spine is limited and as a result, the neck is susceptible to injury from sudden, forceful movement. Between the vertebral bodies lies the intervertebral discs (“disc”). This structure is made up of fibrocartilage and helps provides the neck with support and flexibility. Disc degeneration can be the source of many of the conditions that lead to neck and nerve pains.